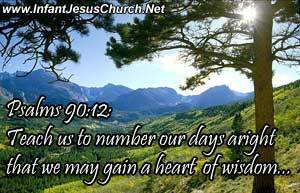 Psalm 90:12: Teach us to number our days aright, that we may gain a heart of wisdom. The things I promised myself I'd accomplish and the deeds I told others I'd do get left undone. So often we look up and time has passed us by. Before we know it, days have become weeks, and weeks months, and months years. We must ask the Spirit of God to help us see and seize the opportunities the LORD places in our path. We find ourselves unable to do what we once assumed we could do any time we wanted. Heavenly Father, we confess that so often we leave undone what needs to be done. Please help us to see your plans in each of our days and live in a way which not only honors you, but also blesses those you want us to reach. In Infant Jesus' name I pray. Amen. My maternal grandfather brought from Poland, in the late 1800's, a portrait of the Infant of Prague that has a little picture of St. Theresa in the top left corner. It hangs in my bedroom and every morning when I awaken, I gaze with tender love asking Him to make my heart meek and gentle like His. The thoughts on today's verse I'm sure will touch many as it did me. Thanks so much for reminding us of this!